If you don't know your ring size, follow these instructions and you should be able to determine it. Using the chart, place the end of the string on the left hand line next to the letter "A" and stretch the string along the sizer toward the numbers. The pen mark on your string should line up with a number to indicate your ring size. 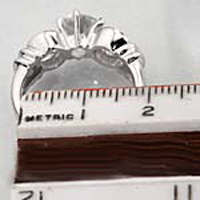 An example of measuring the diameter of a ring. The inside of this ring is approximately 18mm in diameter, making it a size 7 on the chart below. Ring sizes vary from country to country. We use the American - Canadian standard: all you need to do is find the equivalent American size to place your order!